The photograph in this college poster is simple, yet incredibly stunning. Sometimes the simplest dorm essentials items complete your dorm room decor in the best ways. You don't want to forget about your college wall decor as you're dorm room shopping for dorm necessities on your college dorm checklist. College supplies like dorm room posters are small, cheap dorm supplies but they can do so much for your overwall dorm decor style! Our Brooklyn Bridge Winter College Poster has an incredibly beautiful photograph that you and your friends won't be able to look away from. If you love New York City, this is a must have dorm item. 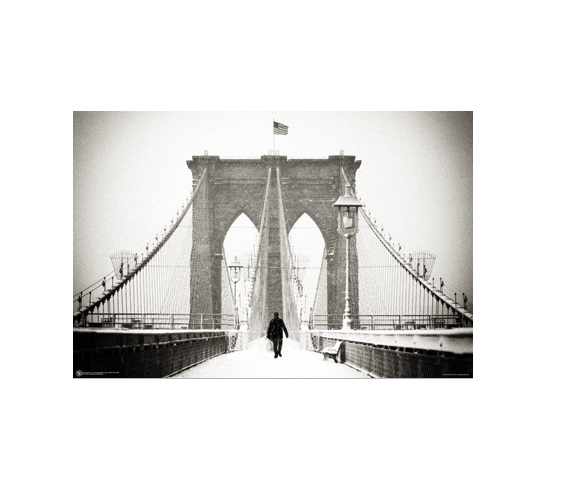 This dorm essentials item features a photograph that is taken on the Brooklyn Bridge with someone walking on it. Behind the Brooklyn Bridge in this college supplies item, it is completely white because this photograph is taken in winter. Snow is on the ground on the Bridge and the outer edges of this beautiful dorm wall art item are bordered in a light gray mist. This dorm essentials item will look amazing when centered over a dorm bed or dorm desk and will be a beautiful complement to your other dorm room decorations!